Behold a new era of bread-baking. Since hearing so many success stories about no-knead bread in the aftermath of publishing The Art of Eating In (which included a recipe for a parmesan peppercorn version), I’ve rekindled a passion for the home-baked loaf. While the no-knead method liberated the baker from spending much time and effort, my current bout of baking pride involves the least amount of ingredients that need to be purchased. As long as you’re handy with what’s around. There are numerous methods for sourdough starter, some involving sugar, others simply flour and water, and some with other starches, like this one which even has instant potato flakes. My friend Noah’s starter had only rye flour and water, and the recipe for it was on the back of his bag of King Arthur rye flour. Now, following this classic technique, I’ve begun making my own with all-purpose flour that I intend to use in a few weeks. 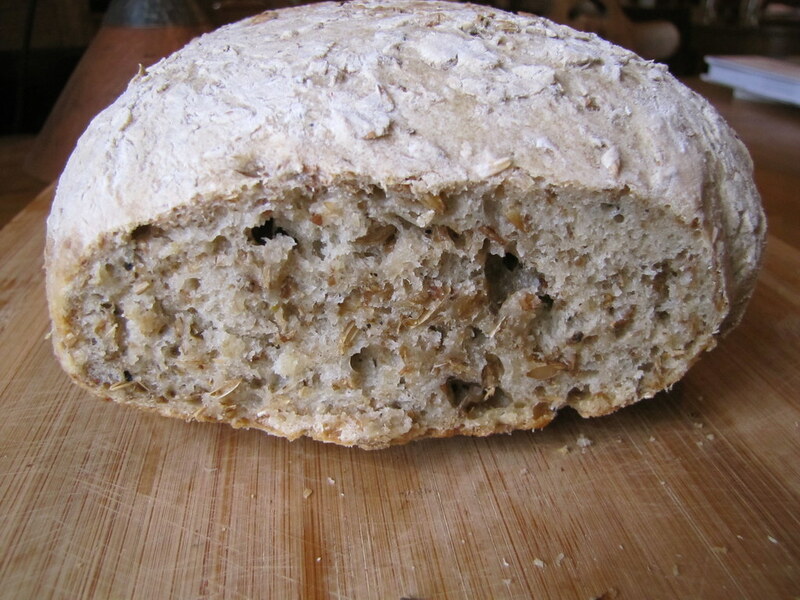 The next ingredient that was finagled free of charge for this bread was the spent grain. There are so many ways in which “spent grain” — a byproduct of commercial beer making — is not yet spent. 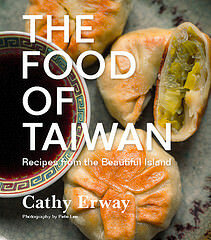 It’s certainly enough to devote a whole blog to the subject. Essentially, spent grain is the stuff that comes out of the mash kettle, like a hot porridge. 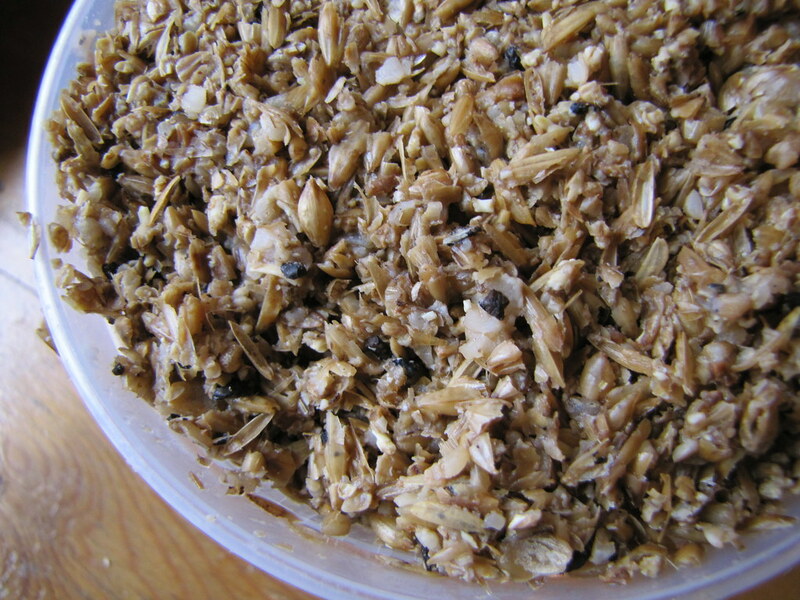 Malted barley, rye, wheat — whatever grain is used in that batch of beer. Think of it as tea leaves after they’ve been steeped. It’s not uncommon for breweries to provide this “mash,” as it’s called, to nearby farmers as feed for their livestock. Or to farmers who might use it as a fertilizer. (I’ve seen the pigs at Queens County Farm Museum go berserk when they didn’t get their mash from Brooklyn Brewery for a few days; Annie at Eagle Street Rooftop Farm is trying out Sixpoint Craft Ale’s mash as a fertilizer for her soil.) What’s less common, it seems, is for humans to consume it. If this is sounding like it was all predetermined, my adding mash to some sourdough like I was on some sort of noble mash-saving mission, it wasn’t. The Righteous Rye Ale at Sixpoint happened to have just been brewed while I was kneading some dough in the kitchen upstairs. And so I added some straight in. 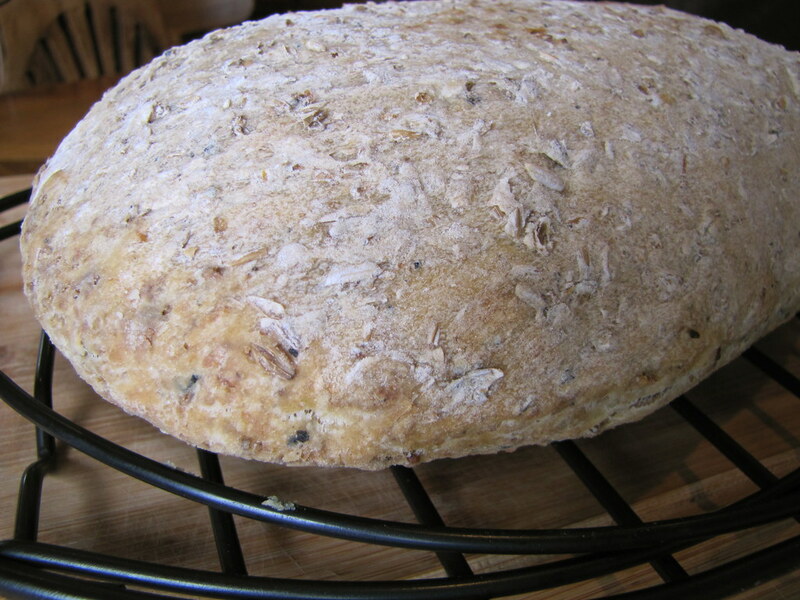 Who knew that the result, though it made the finished loaf much heavier, would taste so good? 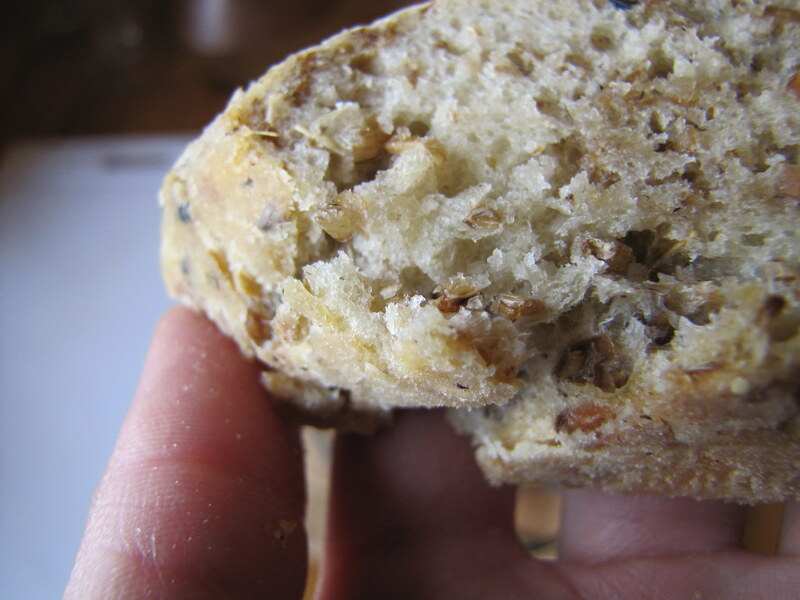 It was chewy, nutty-tasting and textured throughout, like a “whole grain” loaf but more complex, and with a slight funk thanks to the starter. This mash had a mixture of barley and rye as well as some rice hulls in it (the hulls are added to help filter the beer rather than flavor it). The rice hulls were probably the scratchiest addition (a good reason why spent grain tends not to be eaten by people is its coarseness), but the rye grains, according to some of the brewers, were at least more soft and pliable than the barley. Hence, more palatable in bread, or anything edible. I realize that not everyone can get their hands on this particular batch of mash, from this brewery in Brooklyn. But I encourage you, if you know a friendly brewery in your neighborhood — or just someone who homebrews — to ask for a bit of their mash, whatever it is (they probably have plenty to spare). And then tell me about how your bread came out! Here’s the recipe, as happenstance as it was born, and I will doubtless be tweaking many versions of spent and/or sourdough bread in the near future. 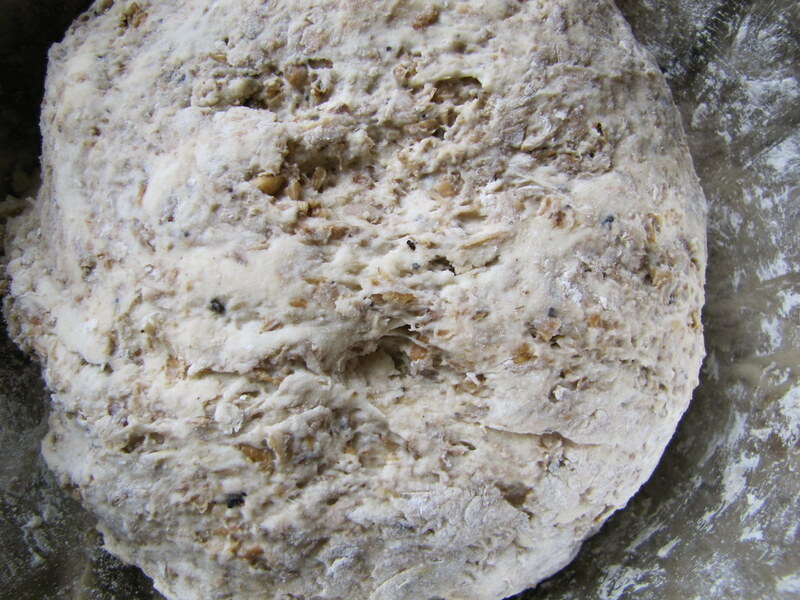 Combine the starter, 3 cups of the flour and enough water to allow the dough to just come together, in shaggy strands. Knead about 5-6 minutes and let rest in a bowl, covered with a towel. Keep in a warm place and let sit for 1 hour. Fold in the mash with your hands and dust on the remaining flour as you combine it to help keep dough from being too sticky. Form dough into a long, oblong loaf (or put it in a prepared loaf pan, which I didn’t have) and coast the bottom and top with flour. Let sit in a warm place covered with a towel for 1 1/2 – 2 hours. Preheat oven to 450 degrees. Dust a high heat-save baking sheet or roasting tray with flour and plop bread loaf on it. Bake for about 20 minutes. Remove and let cool on a rack for 10 minutes before eating. Three brownie points: We’re talking just bread, not a complete meal, but as far as breads go, this is definitely carries a well-rounded nutrition in itself. The hearty whole grains which stud each slice are still full of nutrients like fiber. Rye and barley both are chock full of ’em. And though this bread is going to taste much more like them than sourdough, the acids caused by the fermentation process of sourdough contribute to better digestibility, and yes, you named it, probiotic properties (that food buzz word). Don’t ask me for the full meaning of what’s behind it. 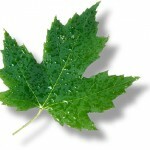 Eight maple leaves: Recycling byproducts of local businesses is great fodder for the home cook, or the commercial one, too. Aside from this blessing of a local brewery’s spent grain, this bread uses sourdough (you could say it was recycled, or passed on) from a friend, which is essentially flour and water, the two other ingredients in the bread itself. Remember to get unbleached flour, such as King Arthur, Hecker’s, and others, which are not treated with chemicals used in bleaching. This looks really delicious. I’m going to seek out some mash now. How did you do your starter? I began a new one a few days ago with just flour and water. Fed every day. The really low stress way to raise a starter. And makes fabulous bread. Nothing but flour water and a touch of salt in the dough. This looks fabulous. I’m going to seek out some mash now. How did you do your starter? I began a new one a few days ago with just flour and water, fed every day. Within two weeks it’s strong enough to lift a dough. A pinch of salt in the dough and that’s it. Meg: So great to hear. I hope our chickens at Sixpoint love them, too! Ken: Oh yes, I’ve been making scratch from start now. I’ve been feeding it only (unbleached) flour so far, and I’m planning on doing that for a while. The starter in this recipe came from a friend, though. Let me know how yours goes, and let me know if you EVER want any mash, trust me, we’ve got plenty!! I’d really love to try this recipe out. My mouth is watering! Great recipe! Have you tried a version that includes more spent grain (dry and ground in a grain mill, perhaps), and less wheat flour? Thanks for the recipe. I have a potato flake starter that I keep up and am always looking for recipes that are different from the normal bread. 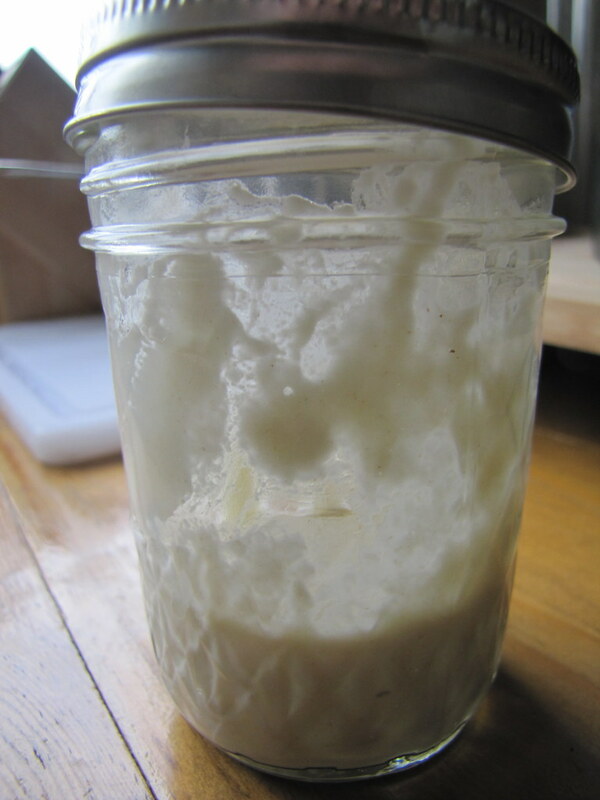 Do you have any other favorites that you use your starter in or any tips for adapting your starter in recipes that call for instant yeast? If you’re baking it, remember to ADD THE SALT! That is not mentioned in the directions.